Western Whiskey Gazette (WWG): Well OK! Henry Campe was a true survivor, lasting through at least three failed partnerships. In addition to stints with Wolters and Siebe (at different times), I found reference to a short lived partnership with a Henry Decker in 1880. It didn't last long though (a matter of mere months) and Decker died in September of that year. Campe also must have had a pretty pliable temperament considering the different personalities of two of his partners at various times; George Siebe and Henry Wolters. If one can believe newspaper accounts of the era, those two were as different as night and day. 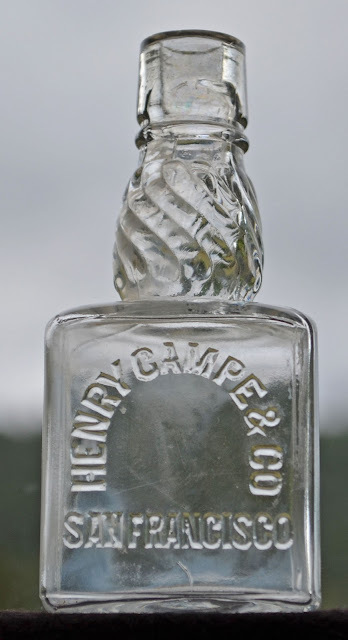 Maybe that's why Henry Campe decided to go it alone in either 1887 or 1888 (the first business directory listing for the firm was in Langley's 1888 edition). They located in the heart of the wholesale liquor district at 301 Front St. By the turn of the century, "& Co." included son Harry & George Harms, and the company was "on a roll". (if you click on the following photos, they will open in a separate window as full sized high resolution images. 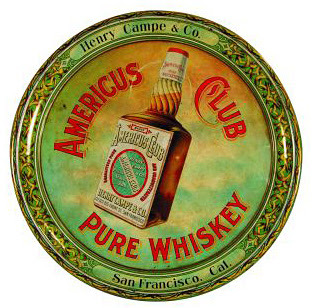 The paper graphics on his flagship product, Americus Club, are both ornate and colorful. 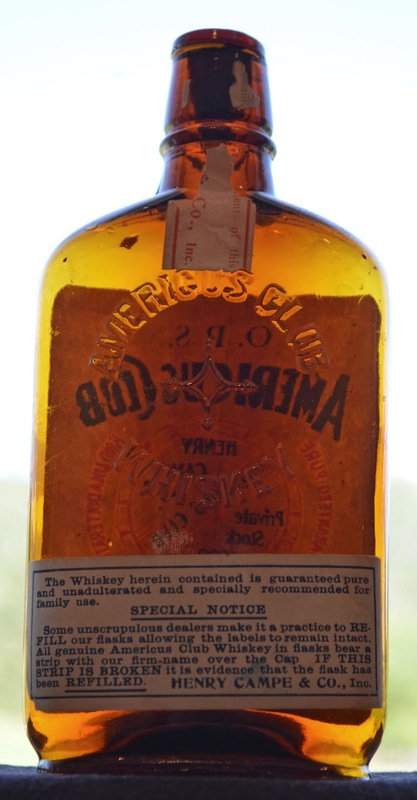 The red, white and blue theme is patriotic, while the "OPS" at the top of the label let the buyer know immediately that this whiskey was something special at first glance. One of the labeled examples that I have on the shelf, a swirled shoulder square, states that the product is from an 1889 distilling. Another, a half pint flask, states that the whiskey in this bottle was from an 1899 distilling. 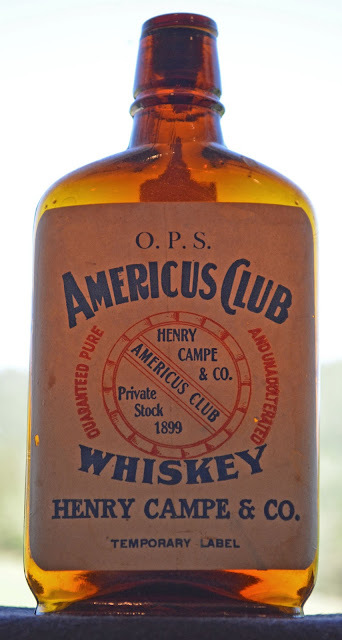 It appears that the Americus Club brand goes back further than previous authors and researchers thought, as most books state the age of the brand as being well post 1900. Not only were the bottles a work of art but so too, were the go-withs produced to promote the brand. These go-withs included shot glasses, tip and serving trays and even a pewter ashtray / match safe combination. 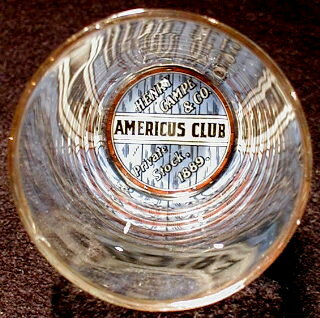 Rick just reminded me about one more go-with item that relates to the Americus Club brand; the miniature bottle. It's a "mini me" of the square squat fifth, right down to the swirled shoulders. They are rare. Another Campe brand was "OK Extra". Although one text lists it as being ca. 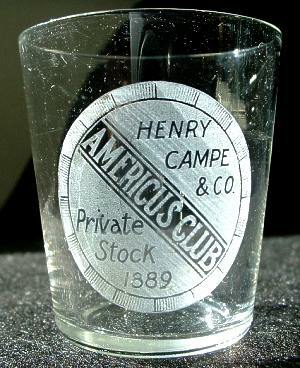 1885, it could not date prior to 1887, which is when Campe established the firm of Henry Campe & Co.. 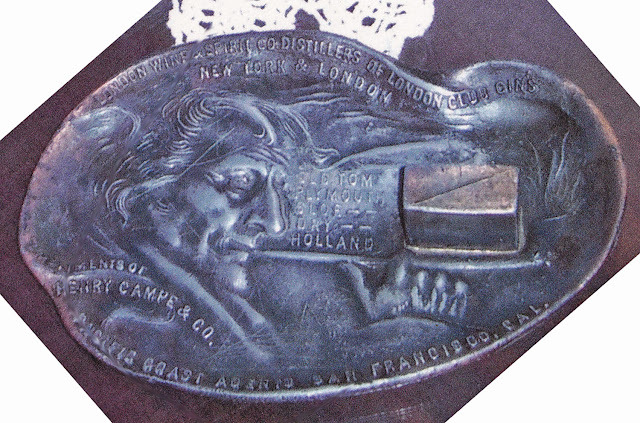 Regardless, this was the earliest embossed mold made for the company. 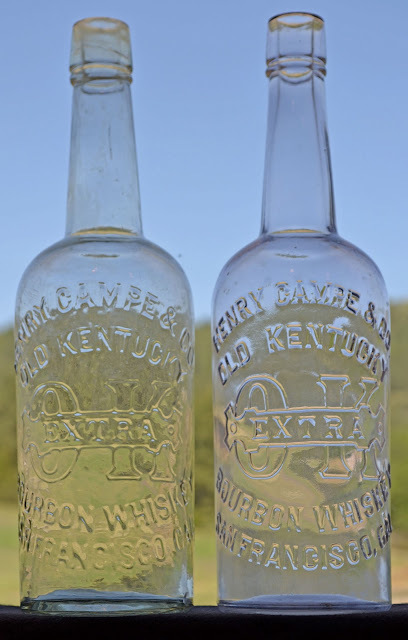 Embossed "Henry Campe & Co. / Old Kentucky / OK Extra / Bourbon Whiskey / San Francisco, Cal." it is the epitome of the western full faced fifth. What few collectors realize, is that there is a very similar bottle in existence which was blown here on the west coast at roughly the same time. Although the embossing pattern was cut to duplicate the glop top, (or visa versa), the actual lettering is crisp and extremely well defined, and the top is tooled instead of applied. It is heavily air vented and neatly made when compared side by side with the glop. Another anomaly is the presence of a distinct circle on the rear. At first glance one might think that it was a half mold with the embossing slug plate removed and a blank installed. My thought is that it was actually a raised border for a paper label. The glass contains manganese dioxide and will turn purple if exposed to UV radiation (ie: sunlight). I would estimate that there are fewer than one dozen of the tooled tops in collections today; making it even rarer than the glop. It took me thirty years to acquire the glop top that sits on my shelf, and another seven to add the tooled variant. Shot glass and tray photos courtesy of Robin Preston from the collection of the late great Ken Schwartz. Back in the early 1990's we dug a Henry Campe mini in Sierra City. It is still in the collection of Rick Lindgren. Nine examples puts in in the same rarity league as the Clubhouse, Durham Chielovich, Millers Extra and the United We Stand / Wilmerding. And well ahead of many of the other so called "hitters". Ha ! Yeah, if it was a red German and not a clear, it certainly would rank in the top 25 ! !